Red needs your help – today! I’m posting this on behalf of a post a read from Facebook by Big Fluffy Dogs. Big Fluffy Dogs in no way asked me to post this, but I want to spread the message further than just a share on facebook. “Well fans, it’s Memorial Day weekend and as promised/threatened, I am working through the list of dogs on our hoarding case that we need help with. The very first one we are seeking help for is of course, an honorary fluffy. We are like that. This is Red. 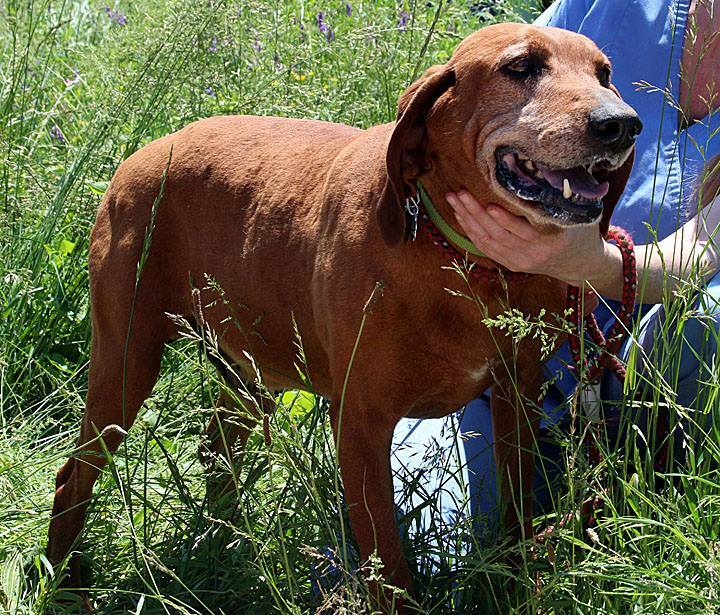 Red is a 13 year old male hound of some sort. You are probably wondering why I picked him to be listed above others who are in worse shape. This is why. Red needs a home where he will be loved. His background is so awful, I can’t help but seek help for him first as I have a soft spot for the old ones. Red was terribly abused by his original owners and was kicked in the head and face so violently, his front teeth were kicked in. Who knows what other horrors he faced, but the people who have him now rescued him from that fate. Say what you will about their inability to care for all the dogs due to exceptional poverty, at least they cared enough to get the dog out. Red is a gentleman dog. He is very sweet and extremely friendly to all, despite his background. It never ceases to amaze me that dogs with that background can trust people at all, and this boy is one of the sweetest souls ever. Amazingly, he was heartworm negative but he does have ehrlychia (tick related disease) which will require antibiotics. He is headed to the vet for neuter and a complete dental and then he needs a foster or forever home. We expect it will run about $500 to provide the meds and dental work he needs, and if anyone wants to sponsor Red, they can do so here:http://bigfluffydogs.com/pay-online.php. Send an email to jean@bigfluffydogs.com if you donate to him so I can a) credit you properly and b) tell Red who loves him. Now, he will need a short term Nashville area foster home, but we think he can go north this coming weekend. If you are interested in fostering or adopting this boy, and you are in New England or Tennessee, email jillian@bigfluffydogs.com. I hope that you can open your heart to Red and to Big Fluffy Dogs. This entry was posted in Furry Friends, Save a Pet and tagged BFDR, Dog, dogs, foster, help, Memorial Day, Pets, rescue by tiannafonz. Bookmark the permalink.